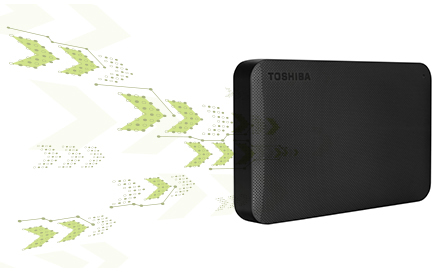 The Toshiba external HDD is available in a range of different storage sizes of 1TB(1000GB). So whatever your portable storage requirements, whether you're saving documents, photos, movies, or a combination, the drive provides the ideal, high-capacity solution. The drive, incredibly fast and backwards-compatible USB 3.0 technology means that you’re able to save and secure documents, photos, movies, and more at speeds of up to 5 Gbit/s. There’s no setup or waiting with the Toshiba External Harddisk just plug the device in to quickly access and organize your files, before unplugging and going mobile. 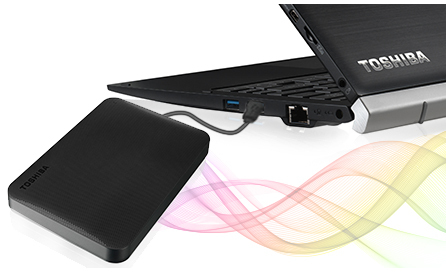 The Toshiba External Harddisk is the ideal companion for busy users who need quick and easy storage. Not only is the Toshiba External Harddisk encased in a discreet and compact black body it's full of features to protect your data, Ramp load design prevents internal wear on the move, while the shock sensor cuts the power in the event of physical stress to the device – protecting your data at all times. Order the Toshiba Canvio 1TB and have it delivered to you within 1-2 working days or same-day within Nairobi. pay on delivery.